8-bit and robots and odd Max and Reaktor patches and custom visual software and visualizations of data packets and sound made from plants and mutant trumpets and gloves for DJing and laptop music – we’ve got quite a lineup here in New York this week. Here’s a look at the performers and projects. If you can’t be in New York, this should give you a little taste of the range of work people are doing here and in our community in general, and I hope to have more coverage after the event. Michael Una performing at SYNC Fest 08 from Michael Una on Vimeo. I will be using custom-built interface devices, acoustic and circuit-bent instruments, and a robot drummer to create a rhythmic, textured and melodic sonic experience on the fly. Joshue Ott/superDraw +Ezekiel Honig live at monkeytown from superdraw on Vimeo. Ott is the creator of superDraw, a home-made software application which manipulates simple line drawings to create something beautiful and far removed from the original input. A New York City native, and founder/label manager for the Anticipate and Microcosm labels, Ezekiel Honig concentrates on his idiosyncratic brand of emotively warm electronic-acoustic music. Using the loop as more of a tool than a rule, Honig paints outside the lines, nestling into a comfortable space between techno, house and ambient – using them as reference points from which to stray, rather than as steadfast frameworks. Drawing on the rich history of musique concrete, Honig looks to incorporate a material nature into his music by imbuing it with a host of field recording/found-sound sources in the search for a balance between digital software innovation and the physicality of the world around us. His music is one of contrast and contradiction, combining minimal, abstract tendencies with a core of timeless harmonics – pairing fuzzy chords with clunky and dirty "mishaps." 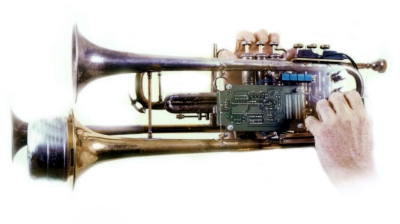 Ben Neill will present a new set of music for Neill’s newly redesigned original instrument, the mutantrumpet. Dubbed “the mad scientist of dancefloor jazz” by CMJ Magazine, Neill’s music “masterfully blurs the lines between electronic dance music and jazz sounds” (Billboard). This new set of future dub jazz is the most recent chapter in Neill’s musical evolution which has included the CDs Green Machine (Astralwerks), Triptycal and Goldbug (Verve) and Automotive (Six Degrees). Neill has also recently created a new version of his unique electro-acoustic instrument, the mutantrumpet, thanks to a residency at the STEIM studios in Amsterdam. We’ll have visuals with Ben’s work, too; final confirmation of the visualist soon. Bill Jones, Neill’s longtime visual collaborator, has created a new set of interactive video for the set. The imagery is primarily black and white and evokes a late-night urban vibe inspired by sci-fi noir films such as Godard’s Alphaville. The video and music are created as one hybrid form of expression, and the new capabilities of the mutantrumpet make it possible for the visual and sonic elements to be seamlessly integrated in real time. Neill and Jones are continuing to explore ways in which the dynamics and improvisation of live musical performance can be translated across the boundaries of sound and vision. Their past projects have included the Pulse series of sound/light sculptures, widely exhibited in the 1990’s, MIDI controlled slide projector shows for Neill’s Sci-Fi Lounge tour with DJ Spooky, and Palladio, a VJ movie based on the novel of the same name by Jonathan Dee. Todd Thille, with Duncan Laurie and … houseplants. Custom circuitry with an Arduino base will acquire electromagnetic signals from plants and use them to influence generative audio and video inside Max/MSP and Jitter. Hally // Blip Festival 2007: The Videos from 2 Player Productions on Vimeo. Paris Treantafeles (aka Voltage Controlled) is an open source software expert and live visualist, regularly associated with the local 8-bit scene. He builds custom visual software for 8-bit game systems. Animalstyle (aka Joey Mariano) has a different twist on 8-bit music: he’s a guitarist, but routes his instrument through 8-bit fuzz pedal, uses a Game Boy foot controller, and mixes guitar and 8-bit sounds. vade (aka Anton Marini) performs visuals on his own custom real-time software. He’s doing something mysterious involving data packet sniffing visualization and joining our VJ/visualist crew for the evening. He’s also a contributor and tipster for Create Digital Motion. Mary Ann Benedetto will also be visualizing and reinterpreting geeky things, likely including munging the Linux kernel visually. Expect some visual surprises – and source releases on CDM for a couple of those visual tools! [Groovy Hand] allows DJ to use hand gesture & head shaking to manipulate music. These gestures visualize how DJ play music, and also ask for sound from audience to generate interactive entertaining experience. In a great music performance, musician are usually encouraged to express themselves with body language and do all kinds of gestures to enhance entertaining effect (such as exaggerated move of guitarist). However, unlike other performer, DJ doesn’t have many chances to use gestures because most of the DJ instrument are not helping him showing gestures, they’re just knobs and buttons. Also, audience doesn’t get a clue how how a DJ produce music because there are only limited visual information from DJ’s movement and gestures. Base on these observation and interview, I created [Groovy Hand], that allows DJ have fun with innovative way to manipulate music. At the same time, visual and verbal interaction between DJ and audience brings audience a new experience of DJ show. Urbanism: Study III from Peter Kirn on Vimeo. I have no idea who this person is, but he kept tagging around, so we had to include him. Okay, it’s me. I’ll be doing a live music set with keyboard and laptop with some custom Reaktor / Kore music tools, plus the debut of a rig for working with Nintendo’s Wii Balance Board. I may jump in on visuals, as well. PETER KIRN is a composer, digital musician, and media artist/visualist. Classically trained, he has extended his work into experimental music for acoustic instruments, historic instruments, and digital sound and visual technology. The Boston Globe describes his music and live visuals as "poetic" and "delicate." He has been a Digital Fellow at Dance Theater Workshop with collaborator Christopher Williams, and has taught music, interactive visuals, and technology at Harvestworks, 3rd Ward, Massachusetts College of Art, CUNY, and Sarah Lawrence. He is completing a PhD in music composition at the City University of New York Graduate Center. Where: The Hotel Pennsylvania, New York City (map); head to the main door, on your left is the entrance to Penn Pavilion and you should see a table there. 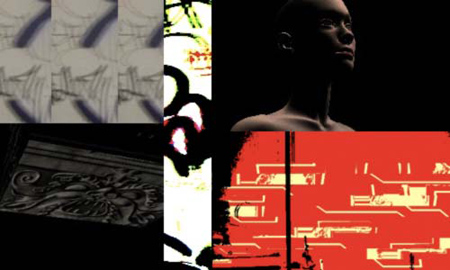 Image credits (top): Michael Una by Hans Kuder; plant installation by Todd Thille; Roger Tsai by Corrine Brown; mutantrumpet designed by Ben Neill; Peter Kirn by Todd Thille; screenshot of visuals by Anton Marini; Don Miller (no carrier) by Cyen Obite; cover from Ezekiel Honig’s “Technology is Lonely”; screenshot of superDraw by Joshue Ott; the Hotel Pennsylvania by Martin de Witte; screenshot of visuals by Paris.